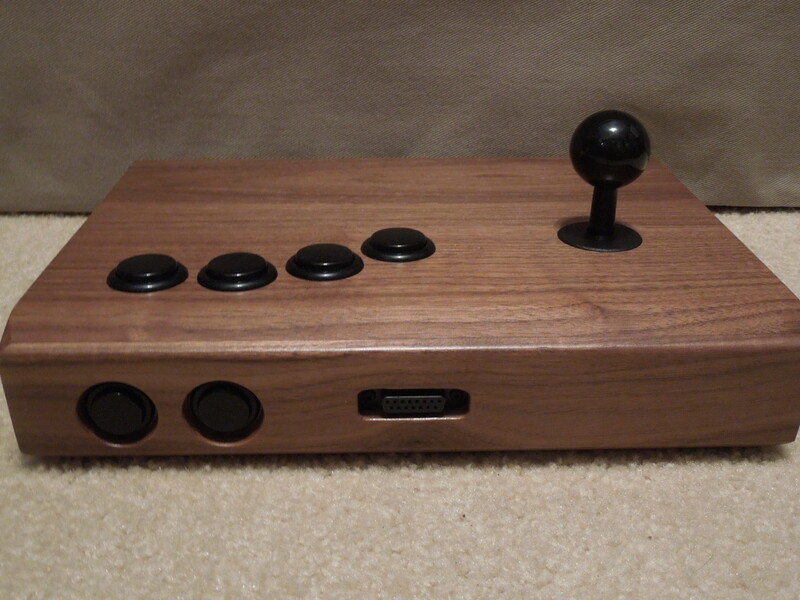 The Analogue Interactive Walnut Arcade Stick for the Neo Geo AES. Note 1: Interested in arcade sticks/controllers? Check out my review of the Sega Saturn VF Dash! Note 2: Like Neo Geo AES games? Check out my reviews of 3 Count Bout, Cyber-Lip, Dunk Dream, Flying Power Disc, Football Frenzy, Neo Bomberman, Sengoku 3, Shock Troopers: 2nd Squad, Stakes Winner, and Super Dodge Ball! 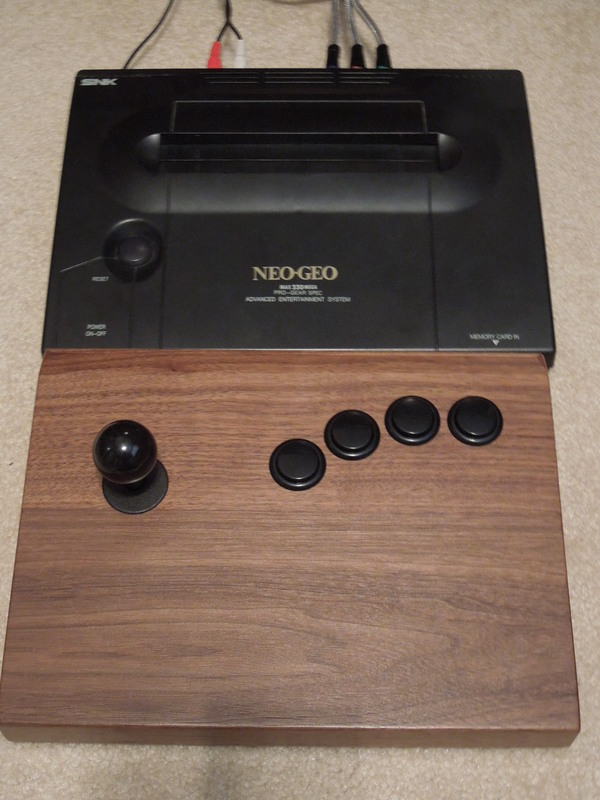 Quick Neo Geo Controller History: There are 3 common Neo Geo AES controllers: The traditional Neo Geo Arcade Joystick, the Neo Geo Arcade Controller Pro, and the Neo Geo CD controller. The first two, the Arcade Joystick and the Pro, are larger controllers that have your traditional arcade joysticks with 4 large, arcade style (although not arcade quality) buttons. They both work very well with the Neo Geo AES home console. The Pro is smaller than the Arcade Joystick, and its actual joystick is shaped differently. The ball on the Arcade Joystick tends to crack over time, while the Pro’s design is more sturdy. The 3rd controller, the Neo Geo CD controller, is a more traditional ‘console’ controller (think Sega Genesis or SNES controllers). The CD controller also works well with the Neo Geo AES, although dirt and dust can quickly accumulate in the thumbstick, causing the contacts to not function properly – this results in you not being able to move in a certain direction in the game you’re playing. The CD controller can be taken apart and cleaned, but this takes time and precision. There are also other Neo Geo AES controllers, from the Japanese HORI Sticks (that feature turbo switches), to the small company/fan-made ‘Arcade’ variety joysticks. 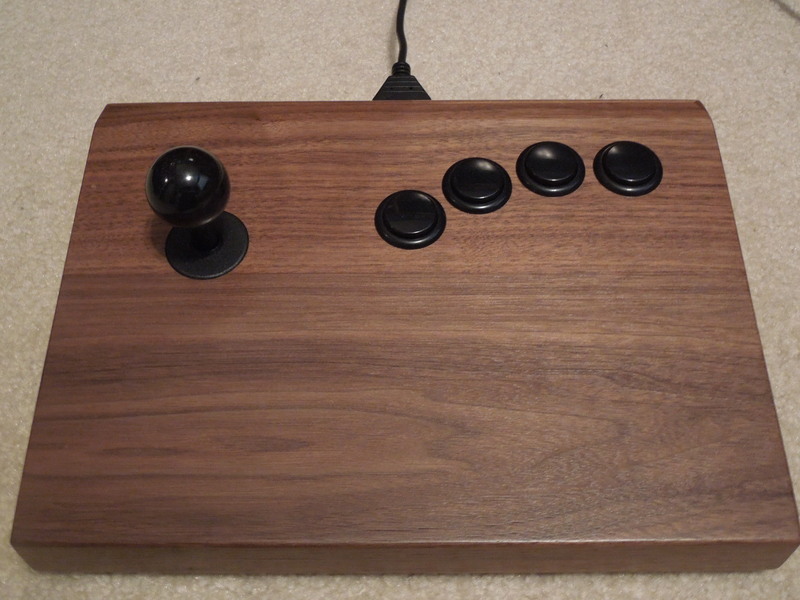 The Walnut Arcade Stick weighs almost 4 pounds. Analogue Interactive Products: You can easily Google the website, but Analogue Interactive started making Neo Geo consolized-MVS home consoles a couple of years ago. These are basically consoles that will play Neo Geo MVS arcade cartridges (since these larger cartridges won’t fit into the Neo Geo AES console). In addition to this home system, Analogue Interactive also produces arcade sticks that work on their own consolized MVS system, or your Neo Geo AES (and actually the Neo Geo CD system too – the controller will work on all 3 consoles). This review is of their Walnut Arcade Stick. The Controller: You can look at all their ‘Tech Specs’ (and I encourage you to do so) on their website, but basically, the controller is made of 100% hand-crafted, walnut wood – it has a smooth, glossy finish. The joystick and buttons are the exact same parts, quality, and design as you would find on a Japanese MVS arcade machine. The Stick: I am not an expert on arcade sticks, although I enjoy playing games with them, but I know this – this joystick kicks some serious tail. It has a light ‘clicking’ noise when you pull it in all directions, and from my experience, perfectly mirrors a real arcade stick from an arcade cabinet. The ball is comfortable and smooth, and you’ll have no problem executing special moves in fighting games or getting your on-screen character to do what you want in whatever game you’re playing. The Start and Select buttons are not on the face, and you can unplug the cord from the controller. Cut the cord: Another great thing about the controller is the fact that you can remove the wire from the back if you want to – no more wrapping the wire around the controller when you need to store it – this is a nice touch. Can I open the controller up? The answer appears to be ‘No.’ The only visible screws on the controller are on the bottom – 4 of them. I removed them to see if I could get the bottom to come off and see what was inside, but the wood on the bottom appears to be sealed on separately – the screws, perhaps, were just holding the joystick in place – I’m honestly not sure. The controller is of the highest quality, and I anticipate no problems with is functionality, but it would be more comforting to know that I could easily get into it to clean/repair if I ever needed to. There may be a way to pry off the bottom without damaging the controller, but I’m not sure I’d every risk it. So, where can I find this controller? Check out the Analogue Interactive website. Many other websites have reviewed this controller (and their console, for that matter), and I’ve yet to read anything negative. My controller took over 2 months to arrive, so keep that in mind. 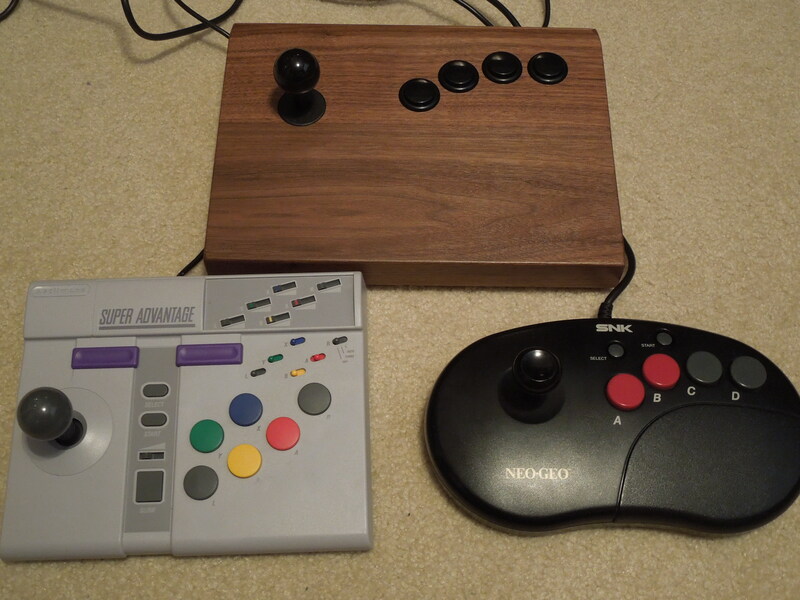 The Walnut Arcade Stick dwarves (somewhat) the Neo Geo Pro Controller and the SNES Advantage. Conclusion: This controller is something special. It is superior, in appearance and playability, to the regular Neo Geo controllers. The fact that it’s made from Walnut is incredible – I’ve never heard of anything else like it. It is quite a hefty controller (it felt heavier than the actually Neo Geo AES console), but this is what you want in an arcade controller. While I’m not crazy about the location of the Start and Select buttons, and I find it slightly concerning that you can’t easily (or possibly not at all) get into the controller if you ever had a problem with a button, this controller is of the highest quality – that much is clear. UPDATE: About a year after buying this controller (and using it often), the SELECT button stopped working completely (which was odd considering I rarely even used it, since it only functions as ‘pause’ in Neo Geo AES games). I tried the controller test on my Neo Geo and sure enough, it wasn’t functioning. I have no idea why, and unfortunately, because I couldn’t open the controller, I ended up selling it on eBay and bought a used MAS Neo Geo stick as a replacement, which has been going strong for years now (working ‘good as new’ as of 2018). Needless to say I was quite disappointed in Analogue since I would have assumed this controller would last for a long time, not just over a year. I don’t know if this was a problem with their other controllers (hopefully it was just mine that had some internal issue), and while I played using the controller, I always took great care of it, but this sadly was my complete experience with it. The Southern Gentleman’s Opinion and Letter Grade: A+, had it worked for years and years. D- for me, however, since for the price and time it took to be delivered, it malfunctioned in a year.